Painting walls can cause many problems. Before painting the walls with old paint, it is worth knowing how to remove old color from them and how to prepare the wall well for the new color. We advise what the sequence of work should be while painting the walls already painted. To paint the walls already painted it is worth to prepare properly. It is also good to make a plan of painting works that will facilitate the organization and help us gain the necessary knowledge to properly paint the walls. It’s worth reading how to prepare a wall covered with old paint before we put a new color on it. Before painting the walls on which there are old paint coatings, remove loose wall fragments, wash the entire surface, and fill the cavities with leveling mortar or filler with a similar structure as the painted wall. 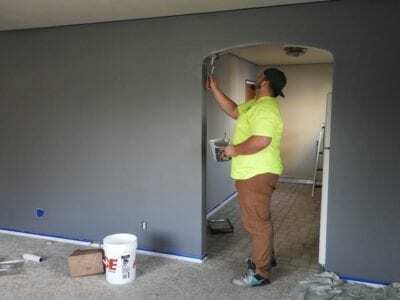 When choosing new paint colors for painting walls in the case of old, intense colors, which we must cover, so as not to pierce the color, it is worth applying primer paints. If these are the manufacturer’s recommendations, use a primer paint before painting with the correct topcoat. It is worth checking at the paint purchasing stage. At the point of sale and on the packaging label you will find the exact information on which primer and topcoat to apply before painting the walls. Old lime, adhesive coatings are not a good substrate for emulsion paints and it is recommended to remove them before painting. The cleaned surfaces are painted exactly like new substrates, which means that it first fills in voids, primes and then covers with paint. When all four walls are smooth, it’s worth to distinguish one or more of them. There are many possibilities: from wallpapers to various wall cladding.